What are dog grates and how are they used? 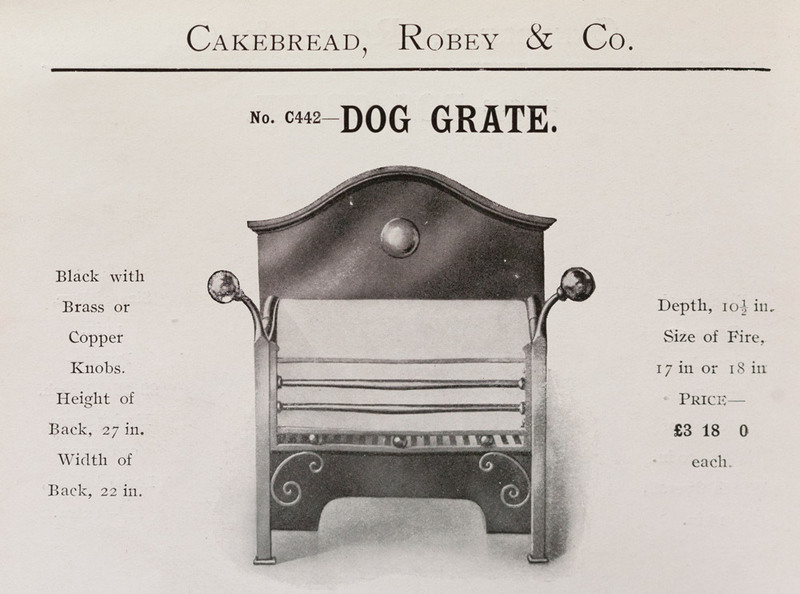 A dog grate, manufactured by Cakebread, Robey, and Company. The company was founded in 1882 in Enfield. It is now part of Jewson. In some houses, fireplaces lacked the cast iron surroundings of Edwardian and Victorian style fires. Sometimes, the chimney breast would have exposed brick or stone, with an opening for the fire or range. They may lack a mantelpiece, unlike the cast iron fireplaces. One important feature of such fires are dog grates. Dog grates can be placed in a central position at the front of the fire. They may be open, resembling a playpen or a crib. Or they might include a chimney flue. This example by Cakebread and Robey (illustrated above), resembles a chair. They are designed for carrying coal or logs and have removable grates, ash pans, and front covers. Dog grates are also known as dog baskets, owing to their resemblance to a dog bed. Depending upon the age and availability, they can sell for any price from £42 to £4,200. If you have any further queries, or wish to purchase one, we at The Antique Fireplace Restoration Companyare happy to be of assistance. The Antique Fireplace Restoration Co.